There is no denying that Texas Pete hot sauce is one of the strongest brands in the hot sauce market. It has a smoky and bold flavor with just the right amount of heat. We harnessed that flavor in our premium, All Natural Beef Jerky to create what we believe is the ULTIMATE hot and spicy jerky. Why Texas Pete Hot Sauce? 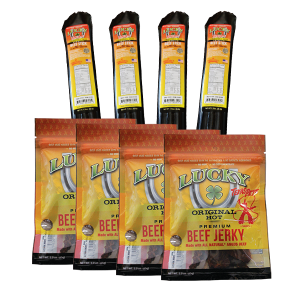 At Lucky Beef Jerky we are constantly looking for new flavors to spice up our line. Texas Pete was a winner from the word go. One of the oldest, strongest, most well respected brands in the hot sauce business, Texas Pete is truly a legend in their market segment. Making jerky wasn’t as easy as one might imagine. We worked painstakingly to create a flavor profile that represents Texas Pete as well as the smoky, tender angus beef that Lucky Beef Jerky has made a legend. 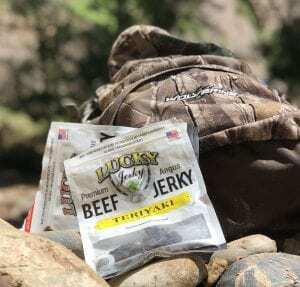 This jerky is not for the faint of heart. If you’ve got sensitive taste buds, you may want to stick to Original, Teriyaki or Black Pepper. But if you like it hot…this is your huckleberry. Give it a try. We dare you. At Lucky Beef Jerky, only the best angus beef is used in our jerky. As an extension of Nebraska Star Beef, we use only USDA Choice Natural Angus Beef. 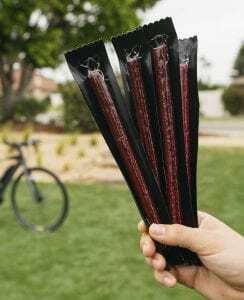 Few companies can boast about the quality ingredients in their spicy beef jerky recipes, nor do they follow our all natural process in producing beef jerky. Our cattle are fed a blend of grass and corn. This feed ration helps to insure the best finish possible. Since our meat is 100% all natural you can enjoy our products with your family, without fear of it ever containing antibiotics or growth hormones. INGREDIENTS: beef, water, Texas Pete Hot Sauce (aged peppers (peppers, salt, vinegar), water, vinegar, maltodextrin, xanthan gum), salt, spice, brown sugar, celery juice powder, spice garlic, spice.